The adventures of our family. April 16, 2010 by Cori D.
We’ve been completely spoiled with beautiful spring weather! Seems so funny that we were complaining about the long winter just a few weeks ago. It’s actually been unseasonably warm, so I hope it doesn’t return to “normal” weather, because we will think it’s cold! ha ha! WordPress has a new slideshow thing, so I thought it would be fun to experiment with it and show you some of the spring in our yard. Enjoy! February 21, 2010 by Cori D.
I saw some little Valentine kits to grow strawberries in the Target dollar section, so I just had to get some. I’m sure I could have spent less gathering the items in the kit myself, but it would have taken more than $3 worth of my time, I suppose. 😉 Ok, purchase justified. ha ha! 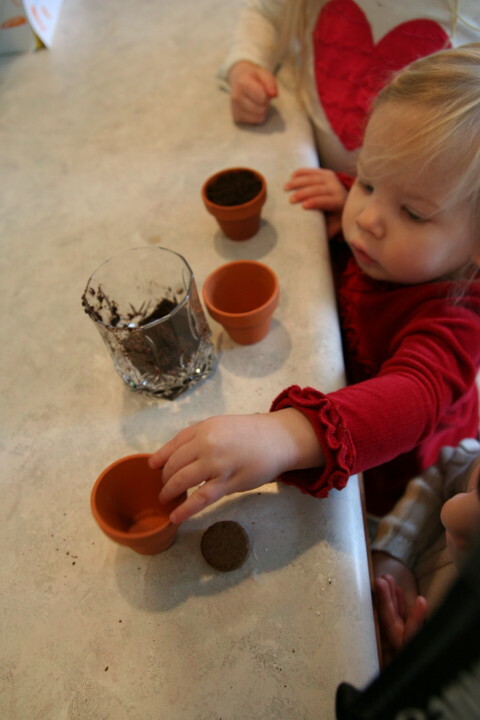 We followed the instructions and planted our tiny seeds into their little pots. We were impressed to see what the water did to the little soil pellets. We’ll see if they grow! 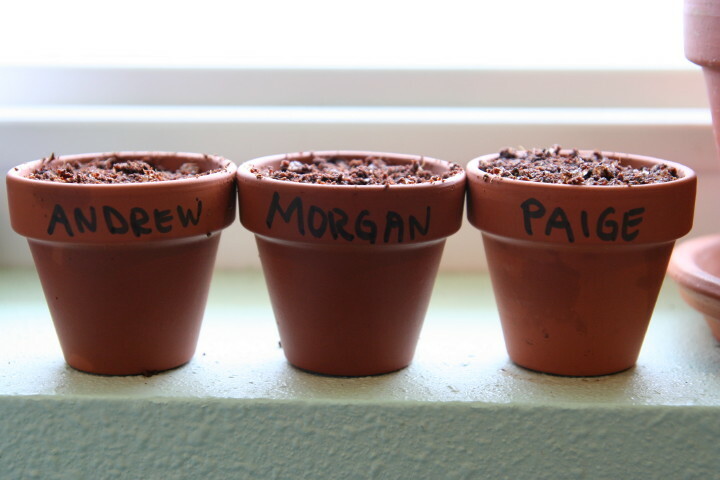 The location seems to be good for other plants, so maybe they will do well, too. 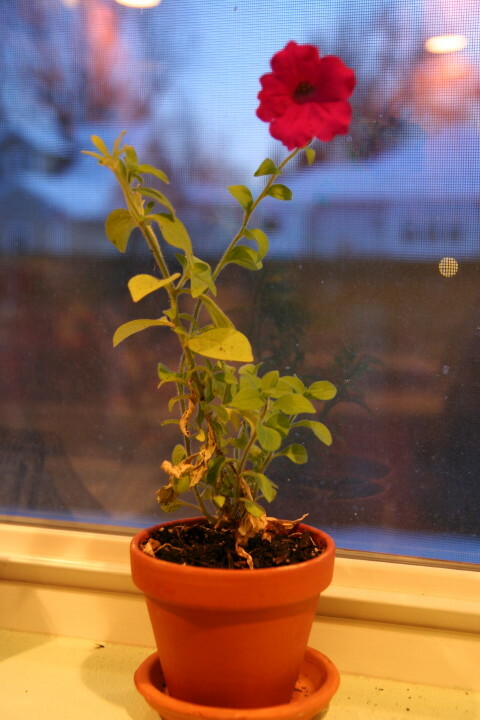 January 5, 2010 by Cori D.
Look what is blooming on my kitchen windowsill! 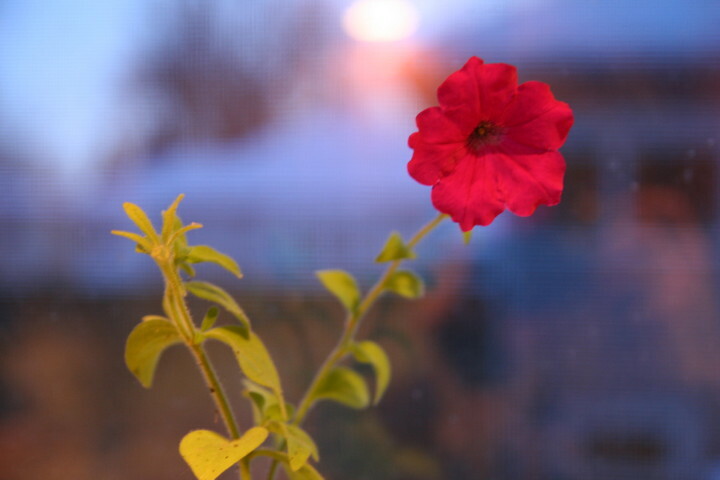 This little petunia was a volunteer that showed up in a large outdoor pot in the fall. (We seem to have random plants popping up in our yard lately. Did you hear about our stray tomato plant?) It actually kept growing after other flowers had faded. I scooped it out of the large pot and put it in the small one above. I wasn’t sure it would even survive, and I certainly didn’t expect it to produce a bloom! It’s a nice little breath of spring, which is heartily welcomed on these bitter cold days of winter! September 17, 2009 by Cori D.
I recently mentioned that gardening would be much easier if one had a garden in their own yard, rather than at Grandma and Grandpa’s farm, as we tried this year. Well, we made a fun garden discovery recently. Our poor sandbox was mostly a mud hole all spring and summer, because it rained so much. We pretty much ignored our dear friend until recently when it has been dry. It had become a jungle of weeds, so we pulled them out and cleaned up our sand toys. All summer one particular plant caught my eye. I thought it looked familiar, so I let it keep growing. I was unsure how this type of plant could have gotten in our sandbox, so I dismissed my hunch and figured it was some imposter weed. I was wrong. Or right. However you want to look at it. Meet Mr. Tomato Plant, growing in our sandbox! I rigged up a “cage” with sticks and string to keep Mr. Plant from covering the entire sandbox. He has continued to grow much taller since this photo was taken. He also has little tomatoes growing on him. These in the photo are no longer with us. The little munchkin whose little leg is showing in the top of the photo tried to eat them. At least a dozen other tiny tomatoes are currently growing. Hopefully the munchkin won’t try to eat them all. And, I really have no idea if they will get large enough and red enough for us to ever eat. But, it’s fun to have this random plant growing in our yard. Not sure how he got there, but we’ll let him stay. 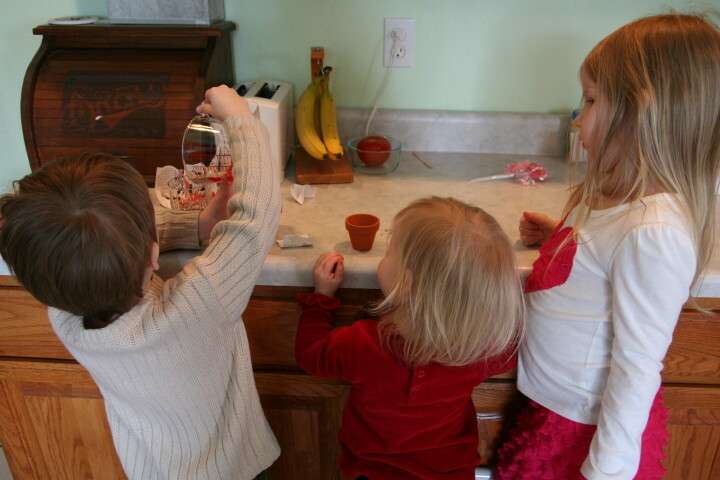 April 16, 2009 by Cori D.
The kids have been very intrigued with seeds, plants and the growing process. We don’t have an ideal yard for planting a vegetable garden, so we are “borrowing” some dirt out on The Farm (aka Grandma & Grandpa Drost’s) this year. This past Saturday, we picked up some seeds at the store (veggies for The Farm and flowers for the yard — I think they would have picked one of each kind of seed available, if I let them). Then, we headed out to plant a few things. We can’t have all work and no play, so the swings were a must as well. P.S. Paige fell asleep in the car on the way out, so we parked next to the garden and she peacefully slept in her carseat during our planting adventures. Lights, Flooring, Cabinets and More! Electric and Plumbing and HVAC, Oh My!